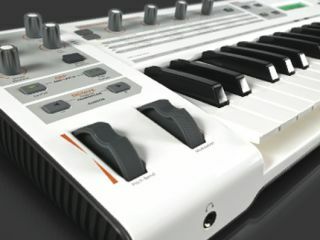 M-Audio Venom: the new synth you're not really supposed to know about yet. The pre-NAMM show leak is something that all companies must fear, and Avid is experiencing it this year as details of its forthcoming M-Audio Venom synth circulate widely around the internet. Officially, all you'll find from M-Audio is a new product teaser page with the tag line 'something wicked this way comes', but a multitude of sites have now revealed more. It would appear that Venom is a 49-note, 12-voice virtual analogue synth that also sports its own audio interface. Leaked text from an advert states that the sounds range from "subtle to downright nasty," while parameters can be tweaked on the hardware or via a software editor. We're assuming that the noises you can hear in the video above originate from the Venom, but we'll be able to get a better idea of how it performs when it's launched on 13 January.